Amazing X-Men is the name of two X-Men comic book series from Marvel Comics. The first was a limited series published during the Age of Apocalypse storyline. The current ongoing series began in November 2013 in the aftermath of Battle of the Atom and is initially written by Jason Aaron with art by Ed McGuinness, featuring a lineup of long-time X-Men characters led by Wolverine. 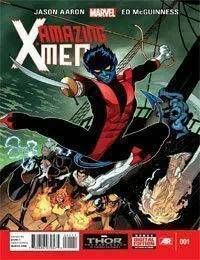 The first story arc features the return of Nightcrawler, who had been dead since the 2010 story line, X-Men Second Coming.